Interview on WBGU- TV from the completion of the Public Art Mural at The Wolfe Center for the Arts , Bowling Green State University in collaboration with Snøhetta Architechts, BSGU and Ohio State Arts Council. 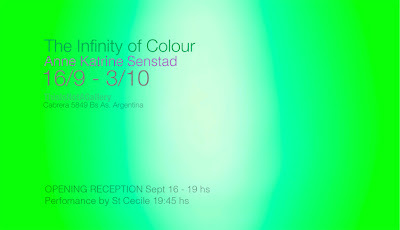 The Infinity of Colour is a documentation of the multiple projection and surround sound installation at THISISNOTAGALLERY in Buenos Aires, Argentina, with the same title. 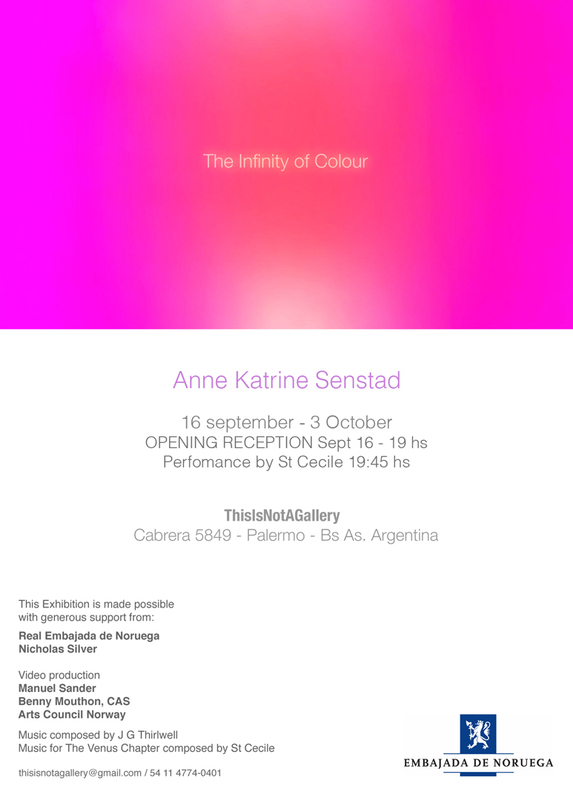 The exhibition opened September 16th 2011 with a performance by Norwegian artist St Cecilie who is responisble for the composition for the video work The Venus Chapter. The soundtrack for this piece is by J G Thirlwell and is the soundtrack for the main video works in the exhibition. The exhibition The Infinity of Colour represents Anne Katrine Senstad’s new body of work focused on light, color and sound. She has created a labyrinthian space of projections and sound that examine the phenomenology and the notions of sensorial aesthetics and experiences of light, color, sound, ocular perceptions, spatial relations and awareness of the process of perception through multi channel projections and the dimensional properties of 5:1 surround sound. 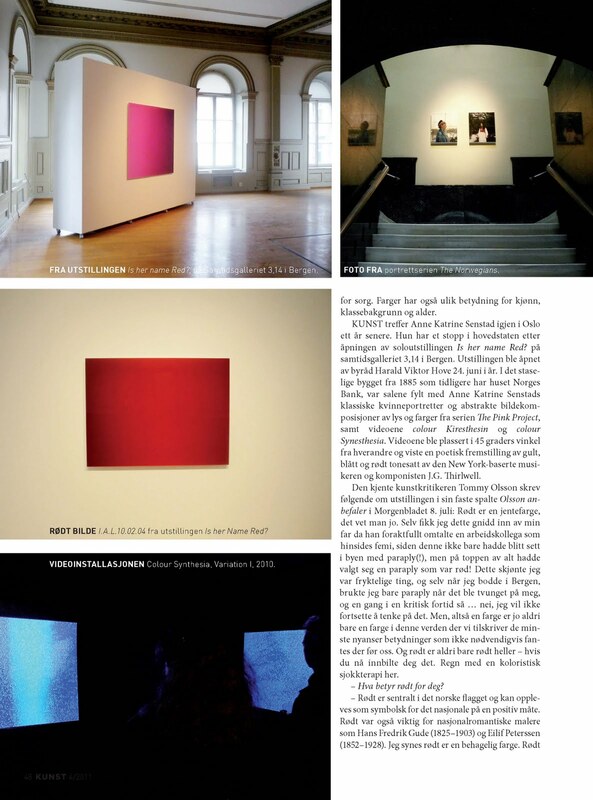 The piece is meditative, pulsating and hypnotic in its simplicity of light, color and sound environments. The exhibition presents the video works: Colour Kinesthesia (2010), Colour Synesthesia Variation I and II (2010-11), KInesthesia for Saint Brigid (2011), The Locker Plant Projections (2011) and The Venus Chapter (2011). Criss-crossing beams of light in Anne Katrine Senstad’s newest installation transform This is Not a Gallery into an alternate experience of space — turning the old industrial warehouse into a theatre of lights, colors and music, housing a troupe of fantastic and transparent images that appear and multiply in the big room, which nevertheless stays strangely empty. There are no reflected objects or persons in the room. In the huge warehouse, three video projectors stand almost at floor level and four transparent cloths hang in parallel to the walls. The cloths are tied to the girders of the tall ceiling and fall vertically towards the floor, without touching it. They form an ethereal square that floats in the middle of the gallery. Each video projector, located in a corner of the hall, projects its light onto the transparent fabric diagonally in front of it. It beams the same image, which multiplies, appearing seven times on different surfaces, on the fabric and the walls, at different sizes, and passes through the transparent material to reach the parallel wall, where it projects the same image, only bigger. Senstad’s installation art in this old warehouse creates an atmosphere of immersion, where the soft and constant movements of light, color, and music encourage a different perception of time and space. The video piece Color Variations II creates differently colored beams that range from diffuse sparkles that spread and flood the room to abstract geometric images, looking like flags of imaginary nations. The outline of a modernist construction suddenly appears in different colors and shades in The Locker Plant Projections, another of the video works. In another piece, The Venus Chapter, a woman walks along the shore at night as if the wind doesn’t exist. The space of the gallery has been turned into an enchanted stage — a site for the abstract coexistence of historical and imaginary periods of time, inhabited by a mix of ghosts and shadows of visitors and characters. At the show’s opening, the sense of the spectral intensified during the performance of St. Cecile, a.k.a. Cecile Richards. The singer, who collaborates and composes the music for many of Senstad’s video pieces, moved among the cloths and videos in a long, white, flowing dress. Her slow movements recalled the image of the birth of Venus, just out of the sea. It invested her figure with a voice, a sound coming from the depths of her body. While the tone varied from low to high, it flooded the room with sound and echoes. Her voice articulated no recognizable word — it remained as abstract as the music and the pure color of light. The empty space housed this solid, snow-white character transmitting this mysterious, floating voice, powerful enough to transport us to a nocturnal scene outside of time where wind is only an image and music is a liquid in which to swim and dance. Videoverket Kinesthesia for Saint Brigid tar for seg de perseptuelle og sensoriske erfaringer man opplever gjennom farger, lys og lyd. Som retinale visjoner i fenomenet The Prisoner’s Cinema, beveger fargene seg i pulserende og hypnotiske strukturer og former, hvor lyd og farger forenes i en koloristisk og artifisiell sfære. 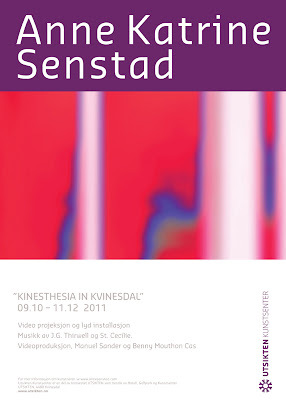 Kinesthesia for Saint Brigid er videoverk nummer fire i serien Colour Kinesthesia og Colour Synesthesia, Version I & II, 2010-11 - hvor serien ble vist for første gang i Norge ved Stiftelsen 3,14 i Bergen, sommeren 2011. Senstad har samarbeidet med musiker, produsent og komponist JG Thirlwell, kjent som mannen bak Foetus, Wiseblood og Manorexia prosjektene. Thrilwell har komponert et dimensjonalt og cinematiskt lydbilde til Senstad’s video arbeider. Fra kunstkritiker Tommy Olssons anmeldelse av Senstad’s utstilling Is Her Name Red? 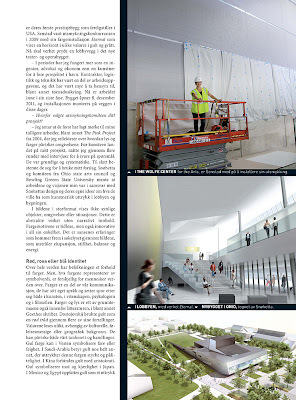 på Stiftelsen 3,14 i Bergen - Morgenbladet 8/7 2011. Farger finnes ikke, vi lever våre fattige liv i mørke. På puten. 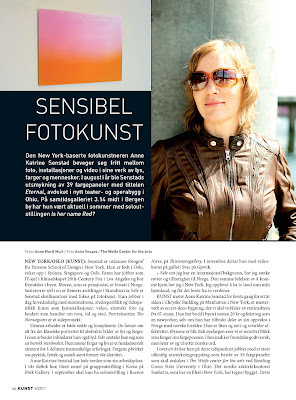 Det er selvfølgelig ikke det som skjer her, der flatene legger seg tett opp mot den mer stille grenen av abstrakt ekspresjonisme som best representeres av Mark Rothko. Dette dreier seg overhodet ikke bare om rødt, eller rosa, men hele malerskrinet – selv om det fremst er primærfargene som blir observert. I videoprojeksjonene Colour Kinesthesia og Colour Synesthesia, plassert i 45 graders vinkel fra hverandre i et hjørne, med sitteputer på gulvet for publikum (selvfølgelig bare meg, og ingen annen, en solsenkt tidlig ettermiddag i Bergen) skifter disse fargene i ultrarapid og gir ikke noen unødvendig informasjon fra seg, siden den uansett ikke finnes. Der jeg sitter på puten og funderer over hvordan jeg i alle dager skal klare å reise meg opp igjen noensinne legger jeg spesielt merke til lydbildet. 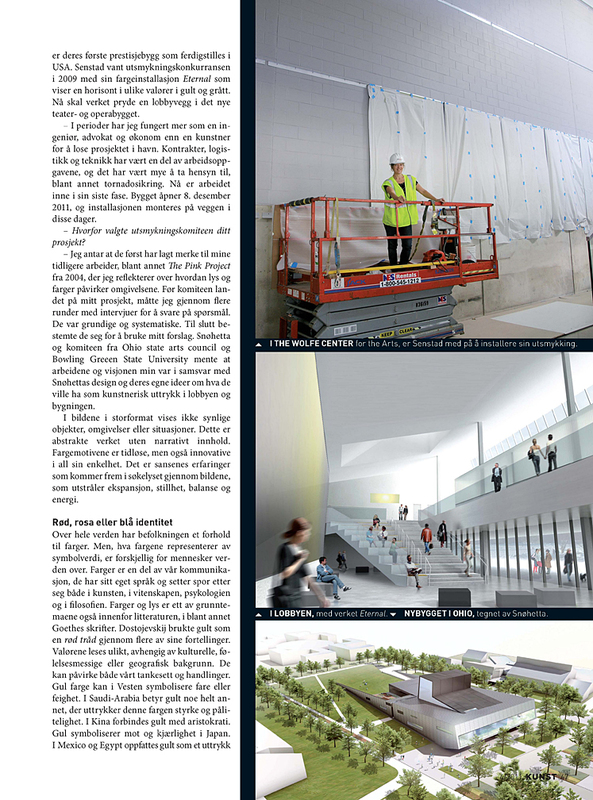 Det er, selvfølgelig, monotont og brummende, og ville fort fått meg til å grine og mislike i håpløs fortvilelse hadde det ikke vært for at det er nok komplekst og gjennomført til at det skal løfte seg over den gjengse standardlyden til nær sagt hvert eneste meditativt videoarbeid som er produsert noensinne. Det viser seg at en gammel helt står bak denne lyden; JG Thirlwell, for noen bedre kjent som Foetus, mannen som under 1980 tallet ga desperat industriell kakofoni en struktur få av hans samtidige var i nærheten av. Selvfølgelig måtte det til noen av det kaliberet for å ikke ødelegge hva som i utgangspunktet faktisk bare er litt gult, blått og rødt i poetisk bevegelse. 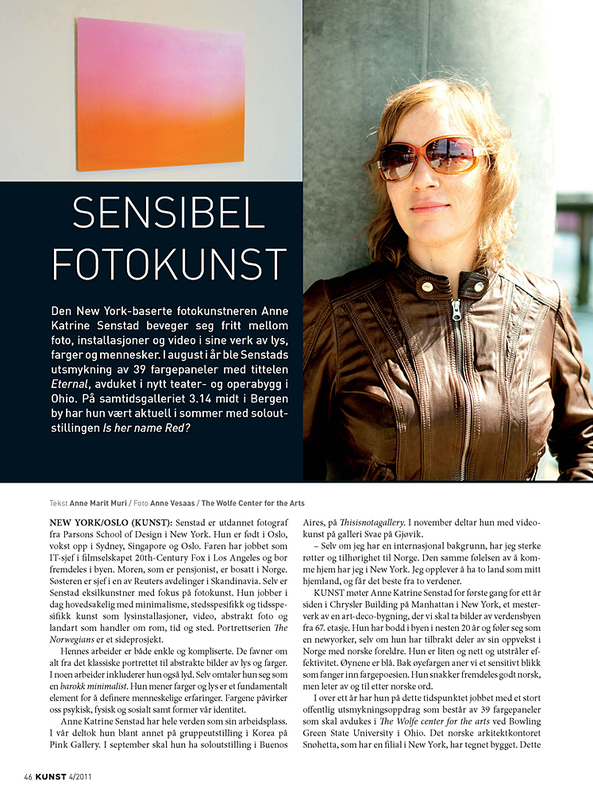 Anne Katrine Senstad er en Norsk kunstner basert i New York og har hatt et langt og internasjonalt kunstnerskap. Hun er representert i internasjonale samlinger, bl.a. 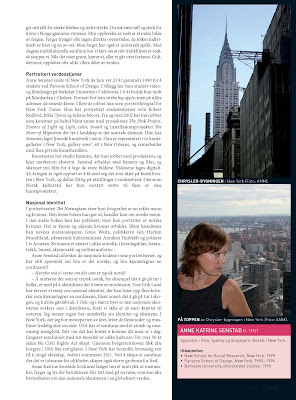 Zendai Moma i Shanghai, Gary Snyder Fine Art i New York og private samlinger i USA, Norge, Seoul, Brasil og Frankrike. The music composed by J G Thirlwell (of Manoriexia,Foetus and Wiseblood), as 5:1 surround sound, creates a physical dimensional sound that moves cinematically from channel to channel within the physical space. The symphonic ambient mindfields of Thirlwell´s compositions strongly corresponds with the visual journey of Senstad's pure light and color. The music composed by St Ceclie for the video piece; The Venus Chapter, is a journey through sensual and emotional spaces that echo the visual experiences of transformations of light and colors, shapes in nature and the human figure. 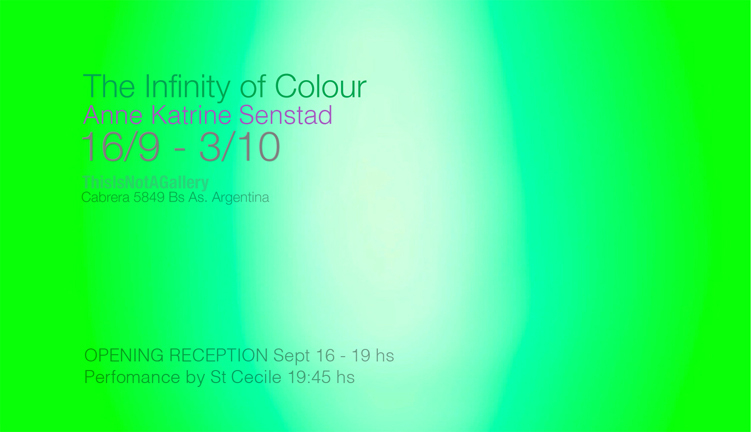 A live performance of St Cecilie's composition will take place at the opening reception. A multi channel video installation at Utsikten Kunstsenter located in Kvinesdal in a fjord on the west coast of Norway. Four channel surround sound by J G Thirwell. The main exhibition will contain the works Colour Kinesthesia, Colour Synesthesia Variation I and II, 2010 and Kinesthesia for Saint Brigid, 2011 - music by J G Thirlwell. Showing in the interior project room; The Locker Plant Projections, 2011 with music by Thirlwell and The Venus Chapter, 2011 with music by St Cecilie.